Look at it. It's beautiful. With a slogan of "Put A Beast In Your Belly", how can you resist? Even the bottle itself is awesome. 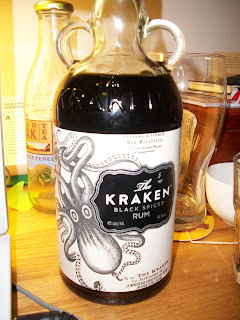 The bottle itself is shaped like the eyes and main body of the legendary sea-beastie, the Kraken. The label has a huge picture of it along with old timey figures, illustrations, and explanations like it is straight out of a biology book. While the bottling is cool, the most important thing is the taste. I tried it straight first, as you can see in the first picture. If you're looking for a Captain Morgan or a Admiral Nelson (Addy Nel, as it's known to college folk), you're in the wrong place. 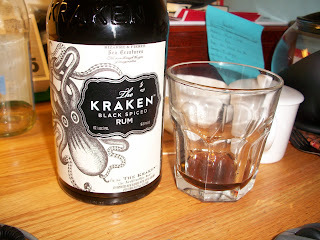 This beastie is dark and delicious, using a high quality deep dark rum as a base. 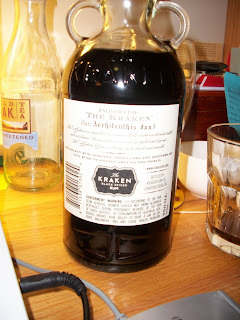 It spices it heavily with vanilla, clove, maybe molasses, and a host of other goodies that give it a complex, brooding taste with a crisp, slightly bittersweet dark rum backing. Looking for a sweet, poundable liquor that tastes like candy? Not quite it. Looking for a more premium version of Captain Morgan with spice that doesn't taste like preground crap from a grocery store mixed with imitation rum? Looking for a spiced rum that'll put hair on your back and a fire in your heart? This be your huckleberry. How does it mix though? As promised, the classic rum and coke was made with the sugar-sweetened Coke. Holy hell. It's so damn good. The problem with the mass-produced spiced rum is that they're so goddamn sweet so you have to mix them with diet Coke if you're anything like a normal human and can't stand drinking 10 pounds of sugar. But this combination gives a super sweet taste with a chemical aftertaste. Gross. But this...this is a thing of beauty. The coke isn't too sweet and neither is the spiced rum. 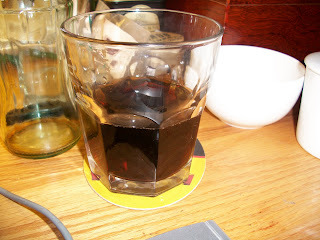 The base dark rum comes through nicely and melds with the coke. The spices come over top of that, dancing around the palette like Patrick Swayze (high fives from heaven, broseph). So yeah, this is probably my spiced rum now. It was only $21 for a 750mL and it's a 100x better upgrade from the Captain. The only problem is, technically, it's not being actually released until March 2010 in NY due to some sort of supply hiccup so this bottle was pretty damn hard to come by (it is some of the stock that they had for an initial release in January that got held off on). Annnnyway, few things are still up on the review board. I'm slightly behind (sorry Red Zeppelin) but I'm getting around to everything. I'm gonna start the search. Fortunately I ought to be able to find it someplace here in nyc. Your glowing review has made me want to try the stuff out, finally. I'm a rum guy, and this is the only spiced rum I've not tried yet that I can get in my area. Why? Because not long ago I realized that spicing your own rum beats the hell out of buying the stuff, and so that's what I do now. I'll be posting about it at some point. Anyway, have you tried Captain Morgan 100? It's actually not bad... I recommend it to people when they need spiced rum.